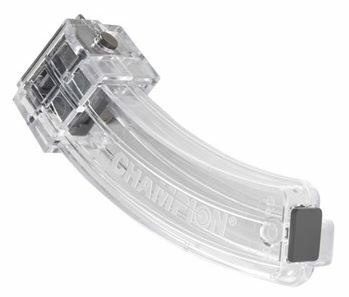 The Champion Targets 30 Round 10/22 Metal Head Magazine features a steel header for long life and a double-stack configuration that allows you to load 30 rounds into a magazine that is compact. The magazine has a removable bottom panel that allows you to clean out debris that accumulates after extensive shooting sessions. The magazine is made with a rugged polycarbonate that ensures the magazine will provide years of dependable shooting fun. Made in the USA.